There are many wonderful reasons to tour Illinois via the Lincoln Highway, but none more delightful than the excuse to stop at Lincoln Way Inn. This uber-charming bed and breakfast is a welcoming getaway that seamlessly blends rustic with modern and beauty with convenience. The original house was built in 1912 by Columbus D. Hussey, owner of a successful lumber company in the area. The current owners, Lisa Marie and John Ayres, are the fourth owners of the home, and the ones who make staying here such a pleasure. Outside you’ll find pretty landscaped grounds and lots of outdoor spaces to relax; inside are common areas with fireplaces, a sauna, and six spacious suites. All guest rooms have private baths and contemporary amenities including pillow-top mattresses, organic cotton linens and robes, desk and chair, and flat screen TV. And each one, named for a different Illinois notable, has unique design elements—such as a hand-carved hickory bed and chairs with Indian blanket fabric—resulting in spaces that are exquisite while being comfortable. Delicious full breakfasts are served each morning in the dining room, four-season porch or, in good weather, on the outdoor patio. Lincoln Way Inn offers special stay enhancements for guests as well, such as Welcome Bounty Baskets, Bee-Pampered Massage, and packages designed around guests’ interests. Looking for a special place to hold an off-site meeting, wedding, or special event? The Inn is ideal for both, with a dining room that seats up to 16, a dining porch that seats 40, and a patio and lawn that can accommodate up to 125. The recently completed Carriage House Loft is another great space, ideal for extended stays and with enough room for small meetings, workshops, or parties for up to 30 people. Like an oasis on the prairie, Lincoln Way Inn is that wonderful spot you’ll be thrilled to have found, and won’t want to leave! 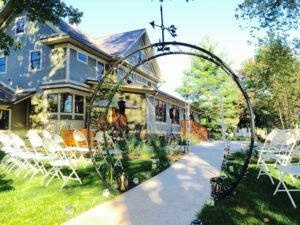 Lincoln Way Inn is a member of the Illinois Bed and Breakfast Association … a unique lodging experience! 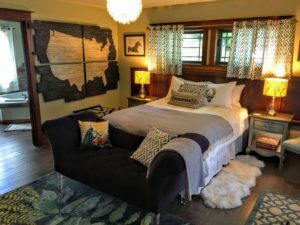 This entry was posted in Illinois Bed and Breakfasts, Touring Illinois and tagged Illinois Bed & Breakfasts by admin. Bookmark the permalink. Fantastic home away from home with family and friends at our reunion. Everything was Class A. Look forward to returning.